Dr. Bryan Belikoff graduated from the Boston University School of Medicine and did his internship at the University of California Irvine. He completed his residency program at the Barnes-Jewish Hospital and is specialized in Radiology. 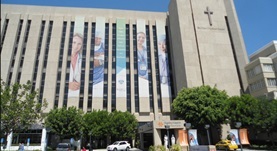 Dr. Belikoff has been in practice for more than 4 years and is affiliated with the VA Long Beach Healthcare System. During his career, he has also contributed to various clinical research publications. Dr. Bryan Belikoff has contributed to 3 publications. Immunological mechanisms of the antitumor effects of supplemental oxygenation. Hatfield, S. M.,Kjaergaard, J.,Lukashev, D.,Schreiber, T. H.,Belikoff, B.,Abbott, R.,Sethumadhavan, S.,Philbrook, P.,Ko, K.,Cannici, R.,Thayer, M.,Rodig, S.,Kutok, J. ...; Sci Transl Med. 2015 Mar 06. Systemic oxygenation weakens the hypoxia and hypoxia inducible factor 1α-dependent and extracellular adenosine-mediated tumor protection. Hatfield, S. M.,Kjaergaard, J.,Lukashev, D.,Belikoff, B.,Schreiber, T. H.,Sethumadhavan, S.,Abbott, R.,Philbrook, P.,Thayer, M.,Shujia, D.,Rodig, S.,Kutok, J. L.,Ren, ...; J. Mol. Med.. 2014 Aug 15. Hostile, hypoxia-A2-adenosinergic tumor biology as the next barrier to overcome for tumor immunologists. Sitkovsky, M. V.,Hatfield, S.,Abbott, R.,Belikoff, B.,Lukashev, D.,Ohta, A.; Cancer Immunol Res. 2014 Jul 06.